CANFIT works to improve quality physical activity in after school programs and find potential policy and system level solutions. Thanks to the generous support of the S.D. Bechtel, Jr. Foundation, CANFIT created an After School Physical Activity (PA) Learning Community in partnership with the Oakland Unified School District (OUSD) After School Program Office. The PA Learning Community was designed to create a network of after school physical activity advocates across the district that can learn more PA activities, share best practices and discuss and advocate for environmental and structural challenges to improve physical activity. 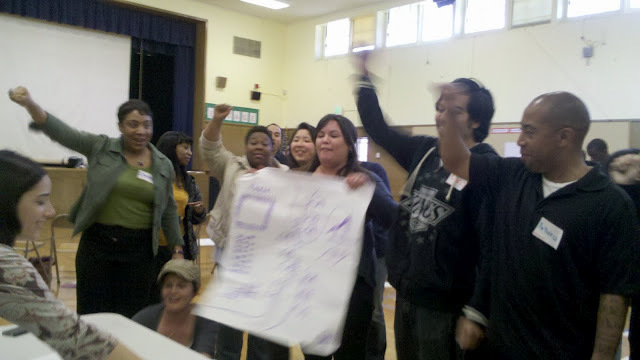 In Year 1, CANFIT led a cohort of after school staff known as the Oakland After School Wellness Learning Community, providing training in leadership and capacity building to improve nutrition, physical activity and wellness for Oakland after school programs. Along with its partners - the OUSD After School Program Office, Gardening Education Program, Team Up for Youth and UC Cooperative Extension - CANFIT engaged staff in a community-driven, shared learning approach that encouraged participants to support and learn from each other. Participants also strengthened their advocacy and leadership skills, thus creating a larger network of future wellness advocates. Check out the Year 1 Report. Also, See them in Action! The 2012 OUSD Physical Activity Learning Community represents 20 after school elementary and middle school programs across Oakland. Guided by CANFIT’s ACTIVE8 curriculum, these leaders are being coached to implement high quality physical activity, develop and advocate for realistic solutions (e.g., joint use, built environment, safety, guidelines) so that all OUSD students have opportunities for physical activity before, during and after the school day. 1)	Utilize their leadership capacity to become actively involved in advocating for physical activity related environmental change in their local communities (and potentially district wide); 2)	Facilitate training workshops of learned strategies within the OUSD after school community; and 3)	Create opportunities for parent and youth engagement to sustain a healthy eating and physical activity culture and habits at after school sites.